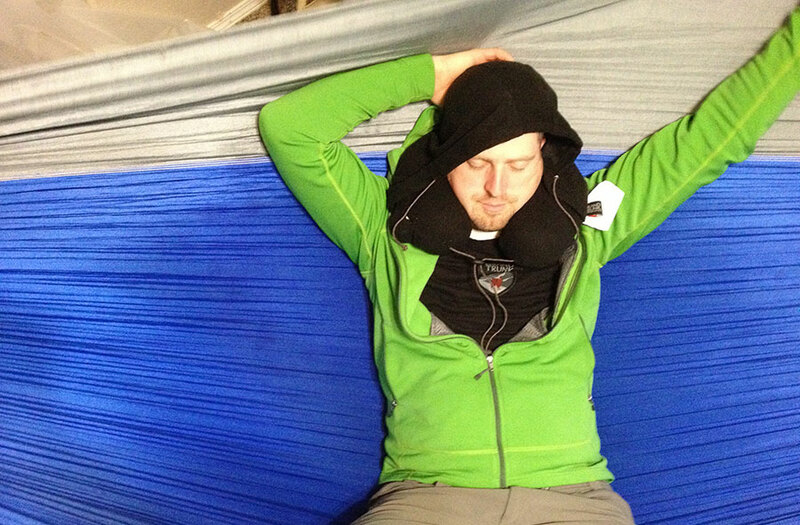 I’ve tried a few different pillows while camping in a hammock, but the ones I find that work the best for me are the airplane- or travel-style neck pillows that wrap around the nape of your neck and provide cushioning on the left and right sides of your head. The Grand Trunk Goods Hooded Travel Pillow combines this style of pillow but adds a storable hood as well. The Hooded Travel Pillow uses moulded memory foam as the padding, which is covered by a micro fleece. The hood is made from the same micro fleece. There are draw cords running around the hood (but no cord lock) that allows it to be cinched up and can even cover my eyes, which is a nice feature. The pillow has draw strings and cord lock that works nicely to wrap the pillow around my neck and keep it in place. On the right side of the pillow is a small pocket, rimmed with some elastic ribbon to keep it tight. This small pocket is just the right size to hold the included stuff sack. This small side pocket is just large enough to stow the included stuff sack. While I can’t say I’m a connoisseur of travel pillows, we do own one, purchased at an airport, and I’ve tried several others. One thing I can say about the Grand Trunk version is how much I like the memory foam. The foam is firm, but still flexible, and provides better support than others I’ve tried. The travel pillow we purchased at the airport is filled with some kind of bead that “sloshes” around so much as to be fairly uncomfortable to me and doesn’t provide much support. The foam in the Grand Trunk pillow is moulded in such a way to have less foam behind my head and more on along the sides. I like this, because my head isn’t lifted or pushed forward. In both a hammock and even traveling, there is ample head support already in place, so having too much padding behind only serves to kink my neck. When I first opened the package, the hood was rolled up around the outer edge of the pillow. There is no storage pocket for the hood, but by rolling it down, it holds itself in place, if the hood isn’t needed. I was really looking forward to the hood because of the perceived added value and warmth on camping trips. 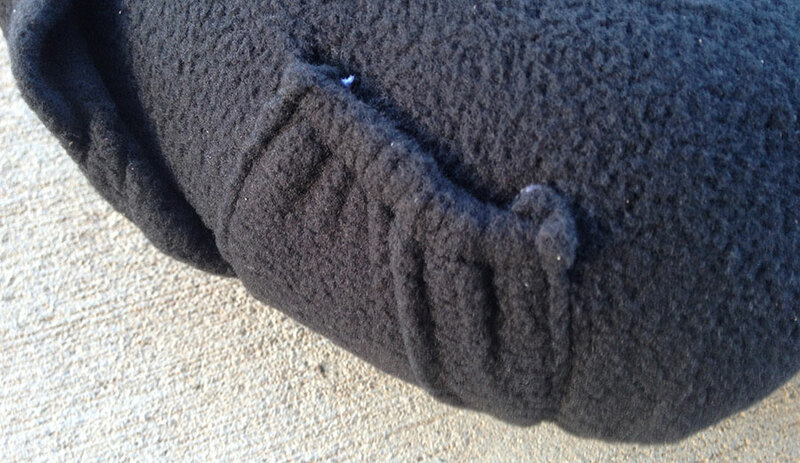 I was a little disappointed with how thin the fabric was on the hood—it is made from the same micro fleece as the pillow covering. While this is fine for plane or car traveling where a thicker material would be overly hot and uncomfortable, it doesn’t provide enough insulation for cooler temperatures for outdoor use by itself. So, while this disappointment isn’t a downfall of the travel pillow—the hood is large enough to easily fit other hoods and hats and insulators underneath—it means I can’t really use the hood as I hoped for outdoor camping, although it can be layered with other gear for added insulation. When I took the pillow on an outdoor hammock camping trip, I unpacked it and left it in my hammock until it was time for bed. The pillow fits nicely in the included stuff sack and can even smash smaller to fit in a pack. When I picked it up and prepared to put it on after leaving it outside for a few hours, I noticed it felt extremely firm and hard; I had to press down hard to push my finger into the foam. I found this curious because I didn’t think that memory foam was affected by the cold. It was only around 40°F (4°C) outside. Still, I was determined to test the hood, so I donned it on and went to bed. Thankfully, the heat from my head and body soon warmed up the foam and it returned to a more flexible and comfortable state. The hood can double as an eye mask. 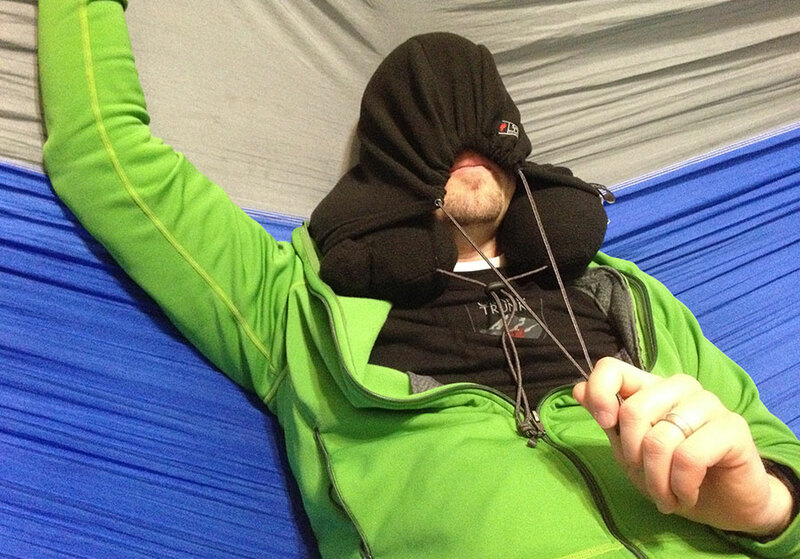 One thing I LOVE about using a travel pillow while in a hammock is that the pillow is attached to my head. This may seem like a small thing, but regular pillows do not stay in place in a hammock. If I have to sit up or even lift my head, the pillow will slide and roll down since the hammock shifts and moves with my body. This is particularly annoying when it is dark and I’m fumbling around trying to find a pillow that has slid somewhere in the hammock. Some have solved this by adding a keeper string that attaches to the hammock directly, but it still requires reaching around. The travel pillow, in contrast, stays put, like a pillow on a bed. I can rely on it staying put or being in the same place I left it when I lay my head back down. In my half-asleep delirium one night, I had awoken to a sound and sat up in bed. When I was ready to lay back down, I instinctively put my hands down around my hips looking in vain for my pillow. Not finding it, I laid down and then I was comfortably reminded that my pillow was giving my head a hug. It was such a nice feeling. The pillow doesn’t feel heavy around my neck or head and when I was walking around in the morning, I nearly forgot it was there. As a lightweight backpacker, I consider pillows a luxury item, so this pillow is likely something I would only bring for base camping and rarely on backpacking trips. I often sleep in a hammock at home, so this pillow is a great asset there, along with road trips and plane rides. Although, since I often do the driving on road trips, I’m sure my wife will get the most use there, and I know she is looking forward to it. I’d love to see a version of this pillow that was designed more for backpacking. I can imagine a version that has a thicker fleece hood and perhaps instead of memory foam, use air baffles, lighter synthetic fill (or no fill), or even reflective inner lining for heat retention and lighter weight. 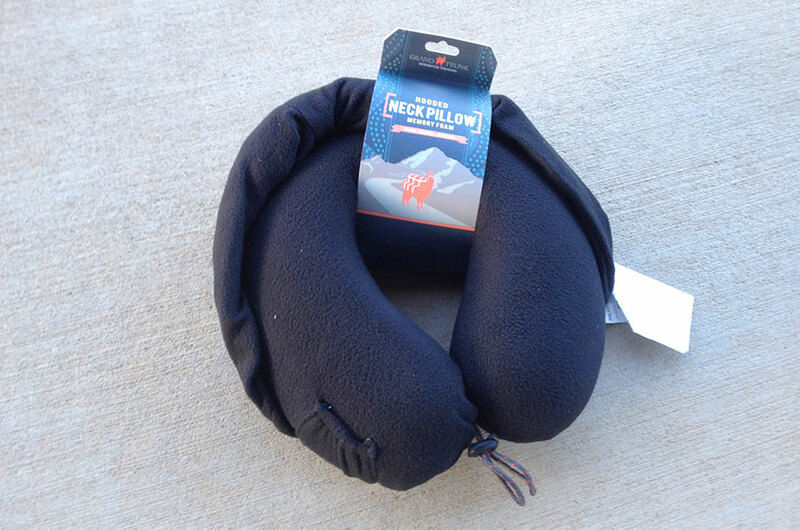 Disclosure of Material Connection: I received the Hooded Travel Pillow for free from Grand Trunk Goods as coordinated by Deep Creek Public Relations in consideration for review publication. The comments in this post are of my own opinion, which I formed after personally handling the gear. Yes, you can sleep on your side. Works good. It is firm enough. The hood can be rolled back and be completely out of the way. In the cold, the pillow was cozy. The fleece isn’t thick enough to be warm alone when I tested it in 20°F weather. I needed an extra hat. It may be too warm in the summer. I’ve used the pillow indoors a few times and was comfortable. Hey Derek–Jon from GT here, thanks for the review! I’d like to add a couple of things i’ve learned from designing and using the pillow if you don’t mind. **I had NO IDEA that memory foam was susceptable to cold temperatures either, until one cold morning, then i decided i could use it to defend myself from anything that crossed my path, like a bear, or an unruly traveler at the airport! After doing some research i learned that memory foam will indeed harden with really cold temps, but like Derek said, will relax when warmed back up. **Other uses: Can be used for side sleeping whether it’s around your neck, or not. Works really well on long flights/car/train rides to sit on for padding, or lumbar support if your back is bothering you. **The HOOD: The hood is mainly used to block out light, the initial thinking was for early morning flights when you absolutely need sleep and your favorite person in 7F won’t shut their blind! What is it with people working on flights at such early times?! 🙂 Can’t you just go to sleep like the rest of us! Very happy that you like the pillow and i hope it comes in as handy for you on your travels as it has for me! Thanks for the insights, Jon! I love the “other uses” tips. The hood does a great job as an eye shield — it is generously cut so when the cord is cinched, it can tuck perfectly around my eyes, leaving my nose and mouth vented. Yeah, it isn’t that warm as an insulator, but it is perfect for what it was designed for. Thanks for making a great product and for the chance to review it! I bought a cheap inflatable horseshoe neck pillow in an airport years ago. Its small, light and I can adjust how much air for how much support I want. I’d love to see someone build a high quality camping oriented version. Good question. So, when we initially launched the HTP we had a zipper, which allowed for removal. Unfortunately, there is a firm in China that holds a massive stockpile of patents, with the sole intention of slapping manufacturers with lawsuits in order to benefit financially. As you can probably guess, they had the zipper on a pillow of our shape covered. So, after paying for our mistake, we approached them to partner/purchase the design, but they were only interested if we would pay a number with a few too many zero’s. For the meantime, it should just be wiped clean with a wet towel and hung to dry. Good news is this, we are working on a couple of new styles that are looking great! Stay tuned and Happy Holiday’s! Keep an eye of Facebook for some great specials for the Holiday’s. do away with the zipper and leave a small opening at one end to extract the foam.